As Commander Scott Kelly and his crew manoeuvred Canadarm2 to capture the Cygnus spacecraft and bring it alongside the International Space Station last December, two University of Ottawa professors were holding their breath until the cargo ship finally docked. Laneuville and Dr. Guy Trudel, who is the principal investigator on the project, are the first uOttawa researchers to study the effects of long-term space travel on astronauts. Working in partnership with the Canadian Space Agency (CSA), they are conducting a five-year, $1.1 million study known as MARROW, funded by the CSA. The researchers are investigating the effects of extended exposure to microgravity on the fat content of astronauts’ bone marrow. Trudel and Laneuville will also measure changes that occur to gene expression within the blood cells produced by the marrow. 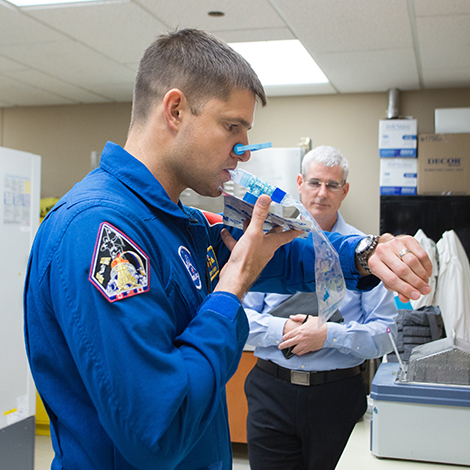 “Other researchers have looked at the effects of being in space on astronauts’ blood, but we are focusing on what’s going on inside the bones, in the marrow, where the blood cells are produced,” says Trudel, a professor in the Faculty of Medicine. The participating astronauts, who spend about six months on the space station, have all volunteered for the study. They are ideal research subjects because astronauts’ symptoms after returning from space are similar to those that people with chronic illnesses or injuries experience if they are bedridden for long periods. Trudel and Laneuville believe that learning how microgravity exposure affects the astronauts’ marrow and blood cells will reveal valuable clues that could improve rehabilitation approaches for more Earth-bound patients who are suffering from the consequences of extended immobility. The researchers have already determined – through bedrest studies and experimental models of immobility – that increased fat in bone marrow may affect the marrow’s ability to generate new blood cells. This drop in red blood cells results in anemia – including the so-called “space flight anemia” that afflicts astronauts after they return to Earth, Trudel says. Altered white blood cells can affect the body’s ability to fight infection, and may also increase the astronauts’ susceptibility to the effects of cosmic radiation. Laneuville hypothesizes that the fat cells within bone marrow may alter the activity of the progenitor blood cells they surround. She wants to see how rehabilitation therapies will affect those cellular and genetic changes once the astronauts return from space. What she learns by tracking their gene expression may eventually help to personalize rehabilitation treatment plans for individual patients. The uOttawa team hopes its research will help shorten the time patients have to spend in hospital, in rehabilitation facilities, and in recovery. “The idea is to get people up and on their feet, moving and resuming their activities earlier,” says Trudel, who cares for patients in need of specialized rehabilitation in his clinical practice at the Rehabilitation Centre of The Ottawa Hospital. Slides show increases in bone marrow fat content in a rat femur following 32 weeks of immobility (right) compared to a control (left). During the five-year project, Trudel, Laneuville and their colleagues will work with 10 astronauts. The researchers are collecting blood and breath samples before the astronauts go into space, during their flight, and after they return. They will also use magnetic resonance imaging and spectroscopy to scan the marrow in the astronauts’ vertebrae before and after they travel to the space station. Then, they will follow the astronauts’ rehabilitation for a year after their return. Research coordinator Theresa Backlund is making frequent trips to NASA’s Johnson Space Centre in Houston to support the collection of the samples. The experiment critically relies on getting the specialized equipment to the space station and then returning samples to Earth, which explains why the docking of the Cygnus cargo ship was so nerve-racking. NASA had postponed three previous launches due to bad weather, and other cargo ships, which depend on rockets for their launch, have exploded. In December, not only were Laneuville and Trudel watching NASA TV to make sure their precious cargo arrived intact, but they were also listening for the voice of a new friend – Canadian astronaut Dr. David Saint-Jacques. Saint-Jacques and fellow Canadian astronaut Jeremy Hansen worked with Trudel and Laneuville at the Ottawa Bone and Joint Research Laboratory on their experimental protocol. They helped adapt the procedure to a microgravity environment to allow for sample collection on the International Space Station. So it was a special thrill for the researchers to hear Saint-Jacques’ voice during the docking, when he relayed instructions from Mission Control Center in Houston to Commander Kelly and the other astronauts. The researchers said that Saint-Jacques’ role, combined with the use of Canadarm2 to grab the Canadian scientific supplies, made for “a very Canadian moment” when the cargo was finally delivered. In June, the first samples the astronauts collected are scheduled to return to Earth, splashing into the sea aboard a Dragon spacecraft. Laneuville and Trudel will process the samples and compare the data to the astronauts’ pre-flight baseline measurements. A vital aspect of the research will be to analyze any reversal in bone marrow changes once the astronauts have been home for some time. If their bone marrow recovers, it might help researchers design new drugs or treatments for patients who spend months in bed. Neither Trudel nor Laneuville were space buffs before this project, but both confess to being hooked now. Laneuville even used her cellphone to record the sound of the Atlas rocket lifting off with the Cygnus capsule. From time to time, as she awaits the samples’ return to Earth, she plays that back – a reminder of just how exciting and out-of-this-world MARROW is. A new video from the Canadian Space Agency features European Space Agency Astronaut Tim Peake explaining the MARROW study aboard the International Space Station.